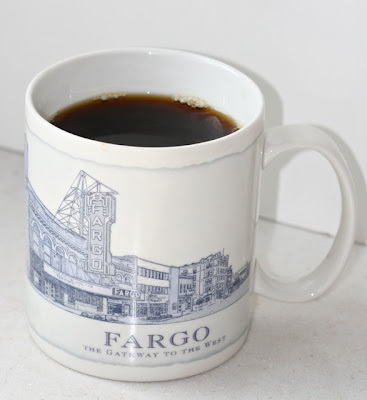 When I moved from California to the Fargo-Moorhead area way back in 1996 there was a great little Italian restaurant in Dilworth, MN that I used to frequent. It was called Paisano’s, had a nondescript decor and was situated in, of all places, a Howard Johnson’s motel. Although the casual atmosphere was nothing to write home about they had a dish on their menu that was absolutely scrumptious. 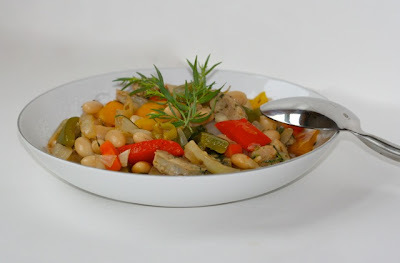 It was a chicken dish served with peppers, sausage with a tangy bean sauce. If I recall correctly it was called country chicken and peppers but I may be mistaken. Sadly, Paisano’s closed many years ago but I still remember this hearty delicious dish. 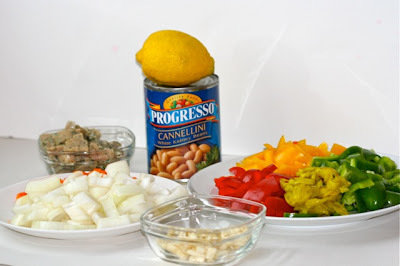 Inspired by the Paisano’s dish I created a chicken sausage and peppers meal with cannellini beans. It is lighter than the meal from the restaurant as that one was swimming in butter. 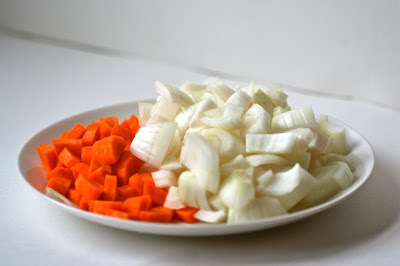 I started this dish by sautéing the carrots and onions in a little olive oil, salt and pepper for about five minutes, just until tender. The dried oregano was added at this point. I then added the garlic and peppers to the pan and cooked them down for another few minutes. 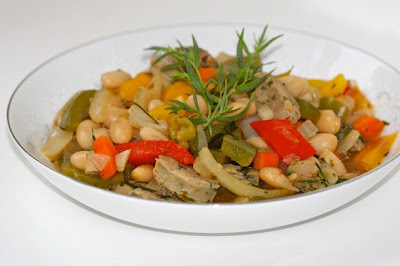 Next I added the chicken sausage and the beans with their juice along with the fresh tarragon. The pan was covered and this was simmered for 4-5 minutes until everything was heated through and the flavors were married. 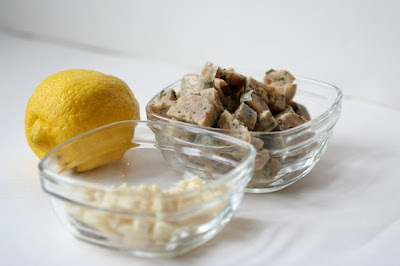 The lemon juice was added at the end of cooking and everything stirred together well. 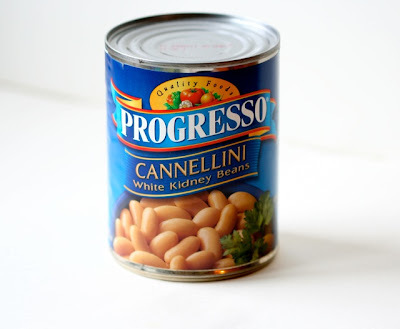 I ate this dish as is but it would be terrific with some good crusty country Italian bread. 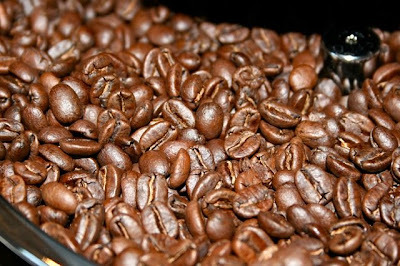 There is nothing better than the smell of fresh roasted coffee except, perhaps, the smell of freshly brewed fresh roasted coffee. Some may call me a coffee snob but after roasting my own coffee beans at home for the last three years I have a hard time quaffing any other sludge that comes from beans that were roasted more than a few days before. Ground coffee from a can? I’d rather have instant. Even the whole bean coffee from the grocery store tastes like cardboard to me. You see, coffee is very much like wine. There is a great range of flavors and profiles depending on where it was grown, how it was harvested, the soil, the climate and finally how it was roasted. 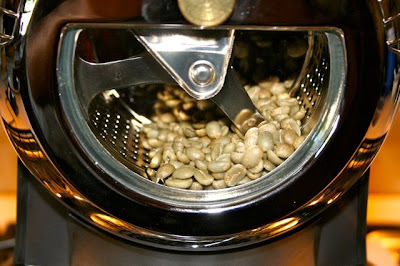 If you truly want to explore the subtle nuances of coffees you need to roast it yourself. Coffee flavors peak about 48 hours after roasting and then go on a decline – a much shorter lifespan than wine. So, how does one roast their own coffee? 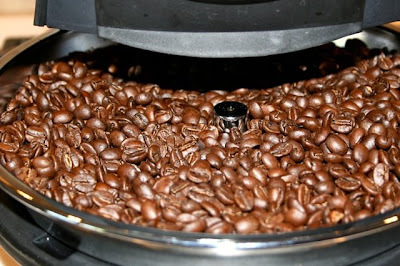 There are several home coffee roasters on the market either using a hot air method (like a hot air popcorn popper) or a heated drum. 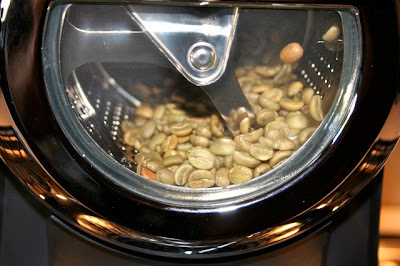 The air roasters are the least expensive and can roast enough beans for a couple of pots of coffee. The least expensive is the FreshRoast Plus. It is simple enough but does not give you good control over the roast levels and it is easy to burn the coffee. You can find several places selling it for about $90 by doing a little bit of searching on Google. A step up from the FreshRoast is the i-Roast. 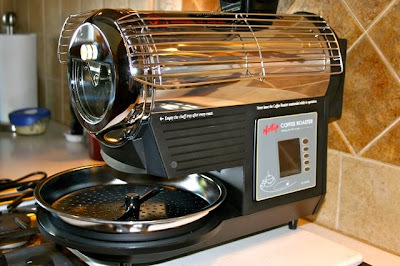 It is also an air roaster but with a better design and it can roast up to a cup of green coffee beans. That is the one I have used for most of the last few years. It will set you back about $180 but it is worth it. I finally moved to the next level – a drum roaster and I couldn’t be happier. The HotTop coffee roaster is the cadillac of home roasters. 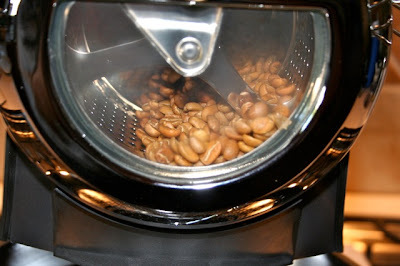 It has much better control of the roasting as you can specifically set the temperature and time of the roasting. This one should last me for years. 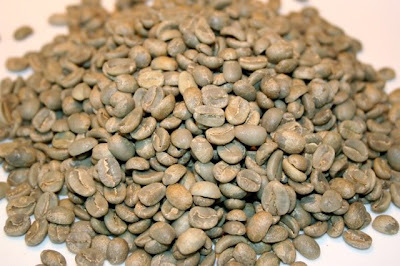 Raw coffee beans, so called “green beans” are generally cheaper than roasted beans and are much better quality. I usually order my beans from a place called Sweet Maria’s who go around the world sourcing small crop coffee. They have wonderful tasting notes and information on optimal roasting levels. You can find many other sources for green beans by doing a little searching. Here are some beans in the roaster. It has started its preheat cycle. The temperature is rising and you can see the green color of the beans turning over into a tan and eventually brown color. The HotTop will automatically spill the beans out into the cooling tray when the desired temperature is reached. These beans were roasted to a “Full City” roast which is just before they become very dark and shiny from extruded oils. At a friends house several years ago I had a soup that just knocked my socks off. It was orange in color and the flavor was interestingly savory with a kick of heat. We all had fun trying to figure out what the base of the soup was. When my host revealed to us that it was made from watermelon I was blown away. I couldn’t imagine that watermelon could make such an interesting savory soup. I am having some friends over for a 4th of July cookout tonight and I thought I would make this soup or at least a variation on the theme. Searching the web I found just the recipe that my friend used over on the Epicurious web site. You can see it here. 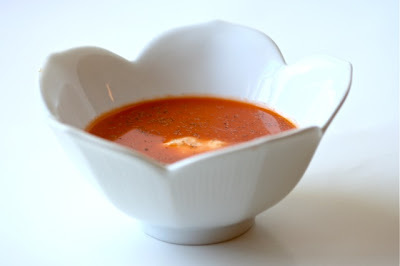 I did make a few changes to that recipe but what turned out was a wonderfully delicious and refreshing soup. The watermelon was puréed in a blender until smooth. A heavy bottomed pot was heated and a bit of olive oil was added. Into the pot was added the chopped garlic, chopped ginger and the soup paste. This was sautéed for about 30 seconds until the aromas were rising from the pan. The lime zest was added and about 1/3 of the watermelon purée was poured into the pot. The mixture was heated to a simmer and cooked for about 5 minutes. Salt and pepper was added to taste. 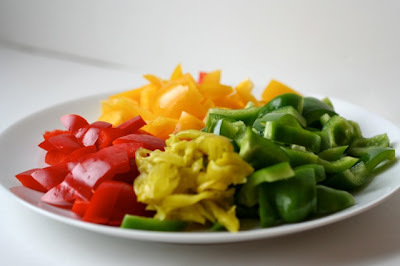 The hot soup was placed into a blender with the chopped peppers and lime juice. This was blended and the rest of the watermelon was added. After blending until smooth the soup was strained through a fine strainer. The combination of cooked and fresh watermelon marry perfectly in this dish. The heat comes through and the Thai soup paste gives another dimension to the flavor profile. I added the soup paste in part because I did not have lemongrass on hand and that is one of the ingredients in the paste. I absolutely adore the bright orange color that cooked watermelon takes on. This could be served warm but I plan to serve it cold. Either way it is delicious.